I recently returned from my summer holidays and can safely say that one of the only things I missed was my guitar. However, the idea of taking a full sized guitar on a plane fills me with dread! The advantages of a travel guitar! Imagine it the fear of having your beloved guitar stowed in the hold of the plane! For me my mind is filled with nightmarish pictures of lost and damaged luggage. You know full well when the baggage handlers are loading the bags onto the airplane they are not going to suddenly handle your guitar with all the love and tenderness that you would expect. But, taking a full sized guitar onto a plane as hand luggage is often not an option. That is where travel guitars come in. Compact and rugged they are small enough to be taken on board as hand luggage. You then have the benefit that to a certain extent the guitar never leaves you and you can keep an eye on it at all times. Now travel guitars have, to a certain extent, had earned a bit of a bad reputation over the years. However, we think that this reputation is undeserved. What are my favourite travel guitar choices. The Hofner Shorty is perhaps the most popular electric travel guitar. First up is the Hofner HCT Shorty Guitar. The Hofner is perhaps the workhorse of the travel guitar world and for just over £90 you can see why it has proved to be so popular. First produced back in the 1980s the Hofner is a full scale length travel guitar which plays really well considering its size. The body of the guitar is made from basswood and the neck is maple with a rosewood fretboard. The Hofner comes armed with a single Hofner Open humbucker pick-up and features tone and volume dials. The guitar is a fairly simple affair but does exactly what it says on the label. This is a no frills travel guitar. Plugged in the guitar is surprisingly good, the humbucker gives a great sound, nice and mellow with plenty of tonal variation. The neck is comfortable to play but the action of the strings is a bit high, not a problem for me but some might like to get the action lowered. The feel of the guitar is good, it is a bit head heavy and playing it sitting down takes a bit of getting used to as it sits low in the lap due to the very small body. However, these are all minor niggles and for me this is a great little guitar, even more so when you consider the price. Hofner HCT Shorty Guitar through Amazon or Gear 4 Music. The Snap Dragon is an innovative guitar with a folding neck! Next up is the Snap Dragon e-Go travel guitar a guitar we covered back in July 2013. 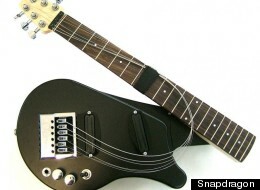 The Snap Dragon e-Go Folding Travel Guitar was designed by record producer Robin Millar and engineer Gerry Dale. The pair designed the guitar so that the neck could be folded back to make the guitar extremely compact. However, the ingenious thing about the Snap Dragon is that the designer claims that when you unfold the neck the guitar will be in-tune and ready to play. The Snap Dragon Tripper folding guitar features a timboo body, which is an ecologically sustainable alternative to the normal tone woods used in guitar construction. It is fitted with two mini humbucker pick-ups, a bespoke neck with 20 frets and uses the patented Evertune bridge to maintain tunning stability when the guitar is unfolded. The guitar looks great and sounds really good too but it comes in a lot more expensive then the Hofner at £325 on Amazon. However, if you are looking for a top quality travel guitar you would be hard pressed to find something as good as the Snap Dragon. You can purchase the Snap Dragon e-Go Folding Travel Guitar through Amazon . The draw back of the above two guitars is that you will need to take a portable amp with you if you want to play them properly. They do have an acoustic tone but really they are travel electric guitars so need to be amped up! We reviewed some cost effective portable guitar amps which would fit the bill if you wanted to go electric on your travels. However, I don’t want to be taking an additional piece of kit along with my guitar therefore my preferred option is to travel acoustically and there are some really good acoustic travel guitars on the market. The Blue Moon BG-10 is a great looking and sounding travel guitar. For me the Blue Moon BG-10 Acoustic Travel Guitar is a thing of real beauty. I just love the teardrop design of this little guitar. This is not perhaps what you would call a conventional guitar shape. This may put some off but I think it is a great looking and sounding travel guitar. The guitar is a compact size, as you would expect from a travel guitar, and is made from spruce. The neck has 19 frets which is great if you like to play chords andscales up and down the neck. It plays well and feels comfortable which is just what you need in a travel guitar. One word of warning this guitar takes a bit of getting used to as its shape, although beautiful, makes it an interesting experience to play. The guitar is a bit neck heavy and certainly is not for playing seated with the guitar in your lap. Really to get the best use out of this guitar you need to have a strap. But that said once you get over this slight issue the Blue Moon BG-10 is a cracking little guitar to play. At £95 at time of writing this is a very reasonably priced guitar and is certainly good fun to play. You can buy the Blue Moon BG-10 travel acoustic guitar through Amazon . 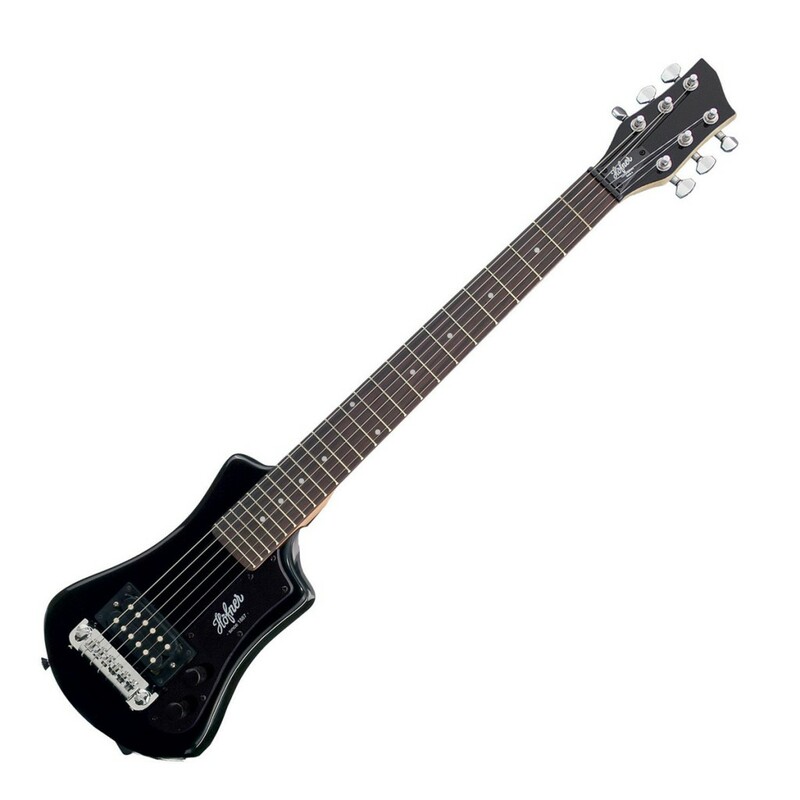 The Washburn Rover has a simple design but sounds great and is excellent value for money. The Washburn RO10NG Rover travel acoustic guitar is a more conventional travel acoustic guitar and so would perhaps appeal to a wider audience than the Martin Backpacker. Made from spruce with a mahogany body and neck the guitar has 17 frets which is great for running up and down the scales. The sound coming out of the Washburn is good, a little bit thin but that is similar for all the acoustics we looked at and is not surprising considering the size. The neck is comfortable to play and the guitar is well balanced. All in all the playing experience is very good with the Washburn. At a RRP of £149 this is a lot better value than the Backpacker and is also a lot easier to play, in my honest opinion. The Washburn represents a good all-round choice for an acoustic travel guitar. The Washburn can be purchased through Gear 4 Music. Good looks, great sound and it is an electro-acoustic too! The Lindo Voyager gets our thumbs up. 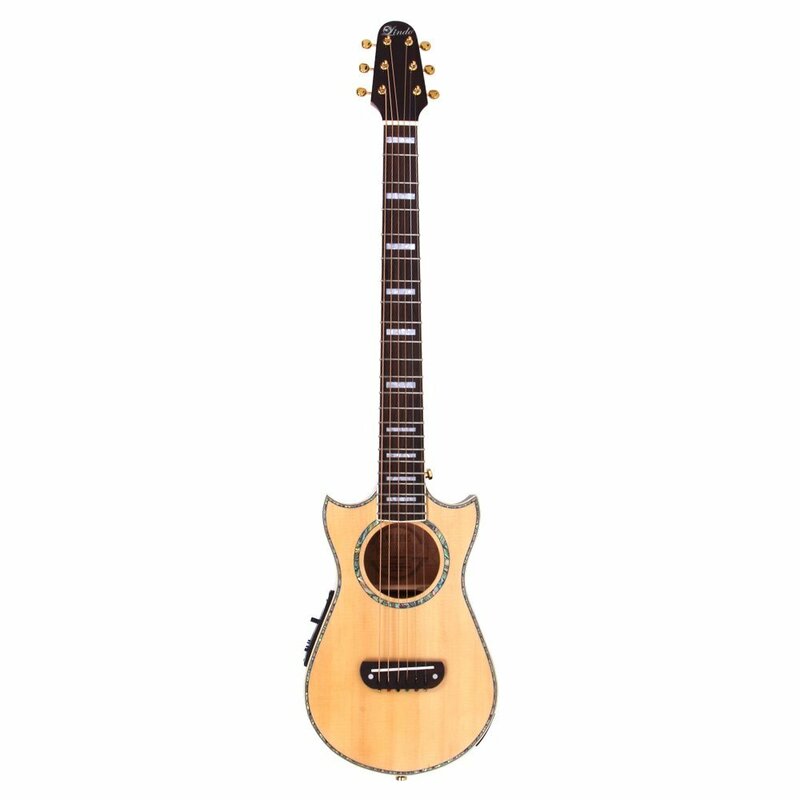 Our final travel guitar is the Lindo Voyager Electro-Acoustic travel guitar. Lindo are a UK based guitar company who design and produce some really great guitars and this one is no exception. 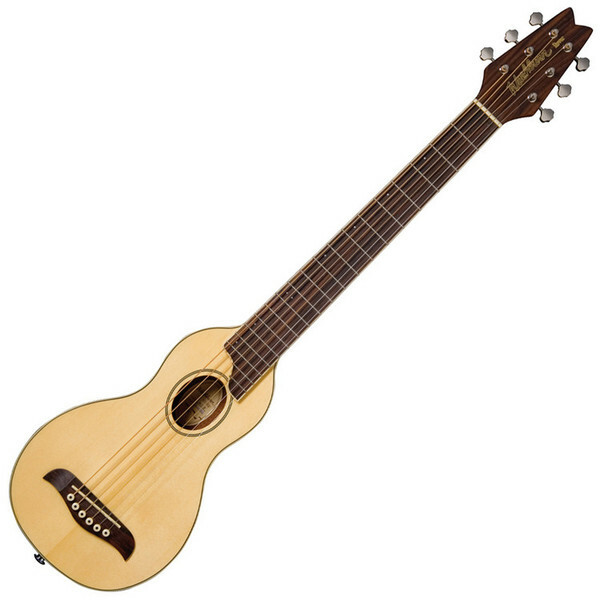 This is a really nice looking little travel guitar and one I certainly wouldn’t mind playing when I am travelling. The guitar has a spruce top and rosewood back and sides. The neck features a rosewood 22 fret fingerboard which is a delight to play. The acoustic tone of the Voyager is great with a good mellow bass sound, surprisingly good in a guitar this size, complimented with clear treble tones. Tonally this is a well balanced guitar. However, for me, what really sets this guitar apart is the fact that it is an electro-acoustic guitar as it is armed with an integrated F-4T pre-amp with built in LCD tuner. This allows you, should you want to do so, to plug into an amp and really rock the night away. For craftsmanship and quality the Voyager comes top of the pack, for me this is the complete travel guitar package. You can buy the Lindo Voyager through Amazon and it will set you back around £300 at time of writing. Which travel guitar on this list is our favourite? So that is it our list of our favourite travel guitars. But the question is which one would I buy? Well for sheer value for money the Hofner Shorty is hard to beat. It is a rugged little guitar which does the job very well. However for me the Lindo Voyager is the guitar that will be accompanying me from now on whenever I am travelling.